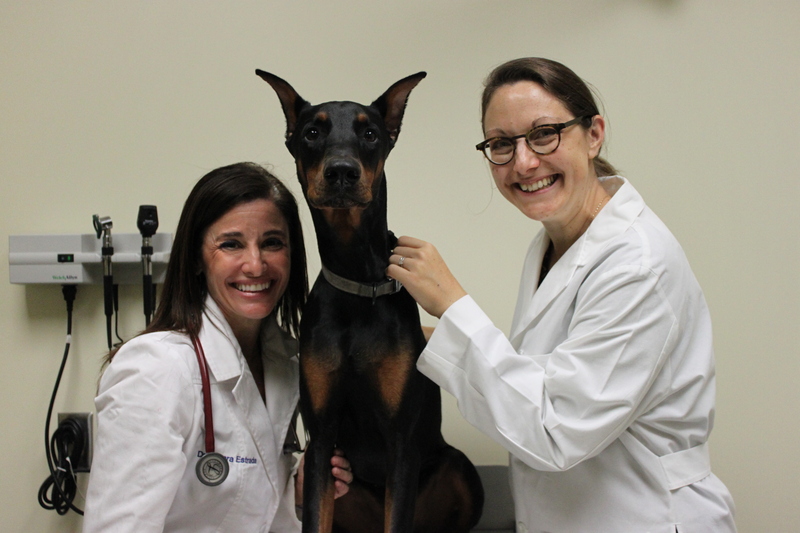 A University of Florida faculty member is one of a three-person team of veterinary cardiology specialists who are conducting a first-ever lifetime study evaluating the influence of genetic mutations on the development of a potentially fatal heart disease that commonly affects nearly half of all Doberman pinschers. Amara Estrada, D.V.M., a professor of cardiology at the UF College of Veterinary Medicine, and many of her veterinary cardiology collaborators across the country as well as College of Medicine colleagues at UF, have spent almost a decade studying the disease, known as dilated cardiomyopathy, or DCM. “While much has been learned over this timeline, there are still many unknowns that require long-term investigation, as well as collaboration with scientists here at UF and other institutions across the country,” Estrada said. Although DCM affects many breeds of dogs, it strikes Dobermans more than any other breed, the researchers said. The inherited disorder can cause sudden death, or can eventually lead to congestive heart failure. More than 1,000 Dobermans have collectively been evaluated over the years. 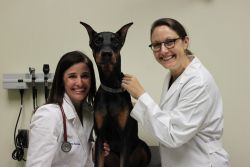 “Important questions have arisen during these evaluations, and we have now launched a prospective clinical trial enrolling 300 Dobermans that have been screened for DCM and followed longitudinally at our respective veterinary practices, national and regional shows,” Estrada said. She and Ryan Fries, D.V.M., also a specialist in veterinary cardiology and an assistant professor at the University of Illinois, came up with the idea of developing a lifetime study of the disease after brainstorming ways of better understanding DCM in Dobermans during a conference in late 2017. The third veterinary specialist involved in the collaboration is Nancy Morris, D.V.M., of Mass Veterinary Cardiology Services in Agawam, Massachusetts. “We have thus far enrolled almost 200 dogs in our study, and expect to reach full enrollment by February 2019,” Estrada said. “Although there are two known genetic mutations associated with DCM, dogs without either mutation have developed the disease, and dogs with one or both mutations might not ever develop the disease. We have multiple projects happening simultaneously that are designed to understand why some of these Doberman pinschers develop the disease and others do not,” Estrada said. Although genetics determine a risk for developing a disease, scientists don’t really know much beyond that, Fries said. The Doberman Pinscher Club of America will be funding the $12,250 study, which will cover the costs of genetic testing for participating Dobermans from cheek swab samples submitted to the North Carolina State University Veterinary Cardiac Genetics Lab. Participating dogs will be followed over their lifetime, with screening tests, owner surveys and outcomes recorded for each dog. Tracking each dog will be a large undertaking, the researchers said. “We will call on our cardiologist colleagues around the country to help us follow these dogs as well as provide regular screening at national shows, regional shows and at our respective institutions,” Fries said. Additionally, the researchers are trying to evaluate the effect of environmental factors, diet, dietary supplements and the amount and type of daily activity on the expression of this disease.